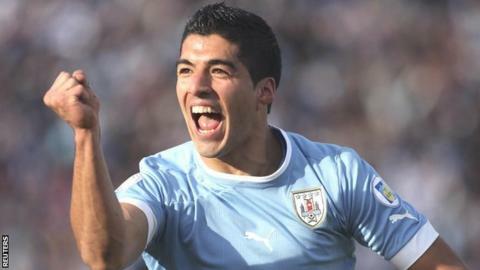 Uruguay have named Liverpool's Luis Suarez in their 18-man squad for this summer's Olympic Games in London. The 25-year-old striker is one of three over-aged players along with Napoli striker Edinson Cavani and Palermo midfielder Egidio Arevalo Rios. Suarez's Liverpool team-mate, defender Sebastian Coates, and Ajax midfielder Nicolas Lodeiro are also included. Uruguay are one of Great Britain's opponents in Group A, along with Senegal and United Arab Emirates. 'La Celeste' start their campaign against UAE on 26 July before facing Senegal on 29 July and finally Team GB on 1 August. Uruguay, who won last year's Copa America and finished fourth at the 2010 World Cup, are aiming for their third Olympic title, after wining gold at the 1924 Summer Games in Paris and again four years later in Amsterdam. Defenders: Sebastian Coates (Liverpool), Diego Polenta (Genoa), Ramon Arias (Defensor Sporting), Alexis Rolin (Nacional), Emiliano Albin (Penarol).